The following picture clearly demonstrates how to properly remove all the measurements on the animal. If all the measurements are taken, then you can begin to build a pattern. 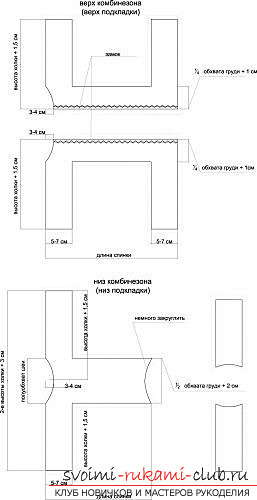 The construction scheme is very simple, below you will see a visual drawing. When the preparatory work is completed, the pattern is ready, then you can start sewing. Sew the top and bottom of the padding on the sintepon. After sew the top of the overalls for the same instructions. Do not forget that on the back of the overalls you need to sew a lock or use ties. Try on a pet's suits. See how the animal behaves in it. Correct all the shortcomings. Tear off all the details of the lining, and afterdo the same with the top of the clothes. When this part is complete, then attach the lining to the top of the garment. You should get almost ready overalls. Now we turn out the product on the wrong side, and we use the contour of the remaining parts, except for the neck and the place for the zipper. We turn the coveralls to the front. Sew a lock on a small lining from the toptissue. He should not rub his back on the animal. Do you want to sew a string instead of a lock? Do the same with pre-prepared strings. 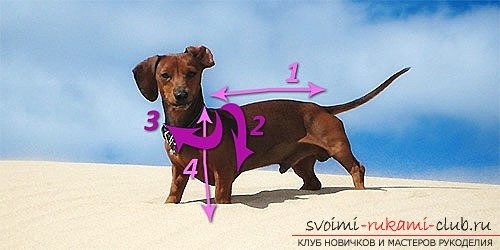 If the throat turned loose, then you can sew an elastic band from inside, so that your pet does not bloom in the winter. Similar actions are carried out with the arms for the paws. Do not forget to do the fitting of the product on your pet, and make some adjustments as necessary. The main work is finished. Now, at your own discretion. You can complement the overalls with various accessories. 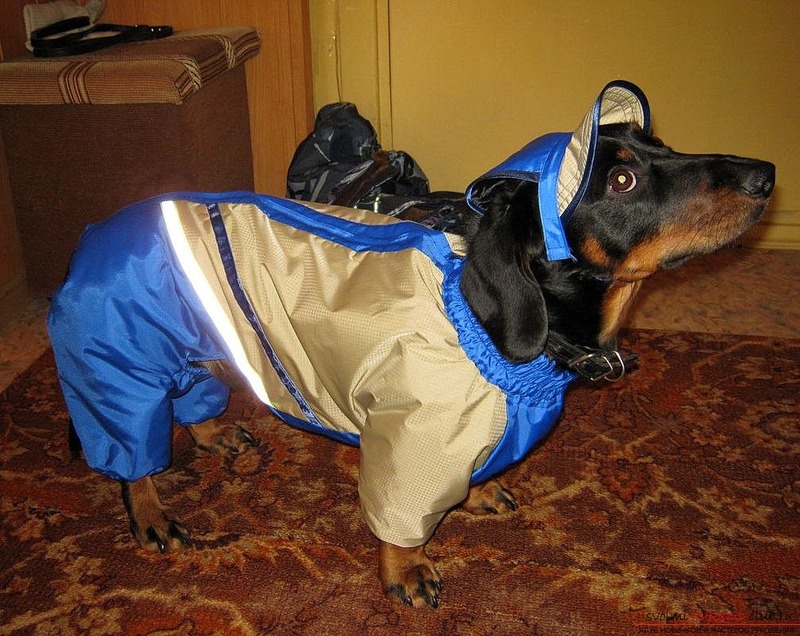 The overalls for the dachshund are ready, and you cango for a walk with a pet, and try out new things. 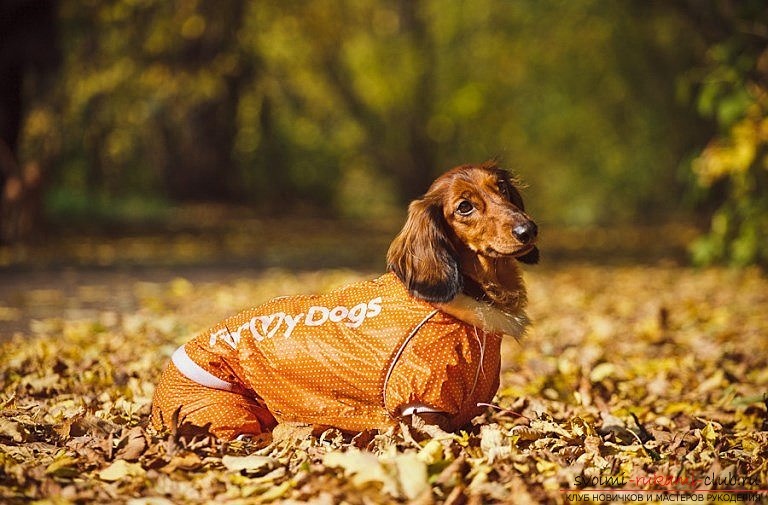 Thus, in just a few hours of sewing, you were able to make a wonderful product using beautiful patterns of overalls for dachshunds. Your pet will come in genuine delight from the new wonderful crafts, and everyone around will admire your skill and sense of style. Create interesting Kanzas from tapes of 2.5 centimeters, boutonniere for wedding glasses of kanzash, ornament in the form of berries kanzashi for gum.